It’s KitchenAid so it’s awesome! I got the Chilli Red color and it’s perfect against our backsplash. They’re quiet, clean and effective for a good cup of hot tea. 1.25 L capacity, Led on/off switch, BPA-Free Interior and Removable Base, Smooth, aluminum handle with stainless steel body, Lime scale filter. 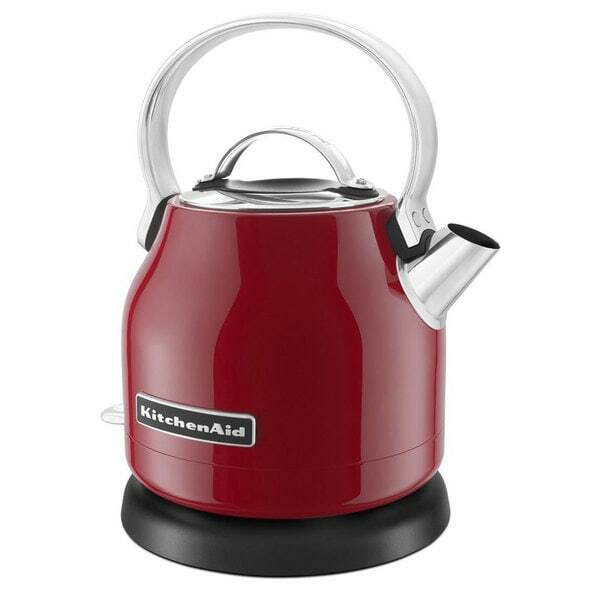 The Kitchen Aid Electric Kettle is simple to use and offers a stylish compact footprint for your countertop. Perfect electric tea kettle! Great to make multiple cups of tea or just one. Makes hot water very quickly and holds heat for a long time. Love the stainless steel! I waited to buy this for when I had a coupon as it is way overpriced for an electric kettle. I have the matching blender so was motivated buy that but all the regular electric kettles out there should do the trick without the $$. Love this tea kettle ! Heats up super fast, and it's stays hot. Very quiet when it's boiling, it's so cute, I love the red as well. Would recommend the Kitchen Aid. Looks nicer in pictures; the materials are cheap and light, not the quality I'm used to from KitchenAid. Would not have purchased in-person. Great appliance for heating water quickly. The pistachio color is so cute. The base of the kettle allows you to wrap the extension cord around it for easy storage. This kettle is awesome. Boils water fast and looks great on my kitchen counter. I have bought two more as gifts! All my friends and family comment on it! "What kind of interior does this kettle have? Metal, glass or plastic?" It has a plastic and mesh filter that is removable.